This summer I visited the Polished Stone technique with this post and samples done with my club. 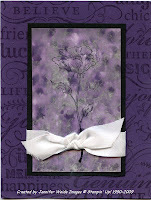 For my presentation, I did the Eggplant card again, but added the silver Encore (metallic) reinker. Please remeber: adding the metallic ink requires that you set the ink with an Acrylic spray, unless you prefer rubbing silver off on everything!! LMK if you have any questions, I'm taking the short & simple way out tonight. Tired even though I didn't do much today but run around in the rain.